Scripting is a form of editing values of code in the Hotel to change, manipulate or edit something. Throughout the years, scripting has been a notorious part of playing Habbo Hotel. Often, the use of scripting was harmless. Most scripting was clientside (only you can see what is happening, not others) and not serverside (everyone can see) but still often happens. By users finding and exploiting parts of the Hotel, Sulake were able to see and patch exploits. These exploits were usually ignored during the Shockwave client until major catastrophes occurred to which the exploits were patched. Scripting also involved the use of programs to edit the game. Many scripting tools were created specifically for Habbo. Mountain Dew Machines were often scripted into hotels and became iconic to scripting community, they are often seen in notable screenshots of scripted rooms, even when they were replaced by the Habbo Cola Machine they were still prominent. 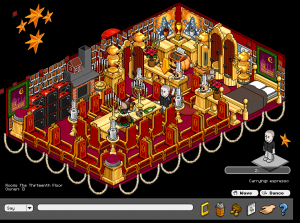 Back in the early days of Habbo, the Habbo Cinema has costumes available when entering the Cinema screen. These costumes were often scripted into private rooms. Similar to the Cinema costumes, users would script different colours of clothing, eyes, skin, campaign clothing and costumes onto their avatars. This also included unreleased clothing that was included in the external texts that Sulake never planned to release. Often, users cloned their Habbo's to create multiple 'Habbos' in a room. This exploit allowed any colour sticky. Habbo Club commands could be scripted for use without paying for the subscription. This involved placing furni inside the walls. Many rooms where people had given rights were later trashed causing the owner to have to re-design the room again. After clicking a Photo, the Photo would open and furniture would appear, usually super rares or unreleased Mountain Dew Machines. The Hobba Help Tool (not useable) and Hobba/Habbo Staff alerts could also be prompted. The photos could also prompt credits and bans (that were client side) and errors. This later followed on to present tags and trophy tags. If you attempted to trade one of these photos, you would be errored. This involved scripting posters placed in the black areas of the room or floors. Error photos caused uproar. The description of the photo had to include a string of numbers. The photo was then added to a trade window box and would error the client. This caused Sulake to add the use of 5 numbers in speech, descriptions and photos to the Bobba filter. Habbo UK Hotel Mananger Jibbi later suggested 5 numbers were blocked to stop people giving out phone numbers and that it was a coincidence that it had patched the issue. On many occasions, serverside Furni was scripted into the hotel and caused major issues as the furniture wasn't real and could not picked up or moved. Examples of this were furniture being scripted into the hotel with different colours, names of furniture being changed and PH Boxes (Place Holder Boxes) being added to rooms. This furniture wasn't real and disappeared after the exploit was patched. This method was done by 'tagging' furni. Each furniture has a string such as ID, sprite, rotation, stack, colour, tag etc. This would be loaded into each furni so that it would display correctly how you left it. The 'tag' section was used for open/close doors and other means such as trophy descriptions. The 'tag' section could be abused on a piece of furni with a new furniture ID to create unique furni. If this furni was picked up, the scripted furniture would disappear. Public and Private rooms could be completely cleared through various erroring methods. Originally, the real-life photo method came around by editing the furniture/avatar CCTs (CCTs are the files imported into the Shockwave loader such as images and code) to include your own images and then loading those CCTs in place of the real ones. After this, real-life photos came prominent using Billboards and the Lido FUSE screen, Habbos could change the image and take Photos to bring real-life imagery into Habbo. This caused the removal of the Habbo Camera due to the uncontrollable amount of pornographic imagery throughout the Hotel. Before this, a very small amount of real-life Photos were floating around Hotels due to the CCT edit method. Although not really scripted, loaders played a huge part during the Habbo Shockwave client. When the Hotel was down for maintenance, users were able to visit outside client loaders that would open the hotel of your choice and allow you online, bypassing the Hotel closure. This was significant during the highly anticipated Version 7 update of Habbo Hotel UK. Users logged on to find that many posters such as Golden Record had converted from the previous Britney Spears Poster. Loaders also welcomed the opportunity to change the look of the Hotel. An example of this is the Coke Music Loader, which showed all Habbos with avatar clothing from the later renamed MyCoke game. Lingo is the type of Shockwave code Habbo was written in before Flash. Users were able to inject any Lingo code, which would allow people to ban and give out credits etc. Most people used the Lingo injection method as a way to change how client images worked. Sonicmouse, active in 2001 - 2003, is one of the most famous scripters of Habbo Hotel. He was notoriously known for causing chaos within the client. He was banned countless times but still continued on similar account names. He is rumored to of been arrested and Sulake attempted to take him to court but settled for an out-of-court settlement. H4660 (or H4660.1) was a notable scripter of 2005. After a few hours of the opening of one of Habbo UK's new Habbo Fansite Drop-in room by Callie, the room was branded with blue PH-Boxes. This happened because the encryption had been cracked allowing users to create server side furniture. This was the first public showcasing of server side 'furni' since 2003. H4660's efforts started a new beginning for server side scripting and many popular rooms were scripted. Later that week the encryption was changed and again many times after until it was finally patched. Jephyrr (or S0CK3T, 13, ) was a American scripter/coder, one of the very first people to exploit the UK hotel (which was the only hotel at the time) with all of the original scripts. He had a notably famous scripted room in 2001-2002 called The Thirteenth Floor. Examples of scripts that he found are waving habbos many years before waving was released, coloured stickies, putting posters anywhere on the screen, putting furni off the screen, spawning furni e.g. dino eggs, blue and gold bods and many more. He coded a program called HobbiX which was his edited version of another program called HabboBee coded by one of his friends. Jephyrr eventually worked out many malacious scripts such as forcing any user to whisper them their password on request and being able to mute and kick other players without Hobba or MOD. Eventually he came to an agreement to work for Sulake and patched all of the main scripts, in exchange he was given a job and became a MOD on the Habbo.ca hotel. Zxsu (or dek) was a British scripter, notable for exploiting the UK and USA hotels. He also leaked multiple MOD logins for the Habbo.nl hotel. He scripted in 2005, similar to H4660. He was along with the few other elite people who found and abused a method to 'tag' server side furni (server side scripted furni). A technique which would allow him to sign a piece of furni e.g. a duck and turn it in to anything. This included server-side coloured furni. You did not need to be the room owner to spawn the furni so it would allow them to replace furni in other peoples rooms with whatever they wanted, most notable the PH box. He also had control of Habbo Hotel USA's homepage for a few hours. "Yes i got arrested by the met police specialist crime unit, yes my computer was seized yes i got given bail, yes i went to court in london, yes i got given 100 hours community service and a fine." Shenk (or vito201-:D, Shenkz, :Shenk and other variations) owned his own website showcasing many scripts, bugs and glitches throughout the hotel. To advertise his website and cause a riot, he created a F**k Sulake room spelt with coins. He is also known for many exploits and scripted rooms. Office.boy owned a large scripting community forum. He is mostly known for his hacking abilities. The Furni below was scripted into hotels by changing the codes when purchasing from the old catalogue to trick the server into thinking you were purchasing something else. The Gold and Blue pods were removed from the catalogue in Habbo Hotel UK very early and were later scripted into the hotel until released accidentally in 2008. The Army Plasto Chair was scripted into the hotel as a special colour that is unavailable publicly. Coloured Bear Rugs were unavailable until released into the catalogue in 2005 on Habbo Hotel UK and thereafter on other Hotels. The Chessboard and Tic-Tac-Toe Board were added to the Hotel FI in 2001. Due to many bugs and errors, they were removed early 2002 and thus scripted onto Habbo UK until thereafter removed from the externals. This page was last edited on 22 August 2017, at 18:31.